STILLWATER, Okla. – Time used to slip by for Mike Yurcich as stars would pass a ship in the night. He’d sit at his desk a few nights a week scribbling formations and schemes on a notepad. Pen and paper served as his laboratory as he drew up plays, dreaming up counters to them and then a counter to his counter. It doesn’t happen as much anymore – time is more limited with his two young sons, Jack and Clay, in the house – but his favorite birthday present in recent memory remains a notebook from his wife, Julie, specifically designed for his experimental scribbles. This is Yurcich’s escape. 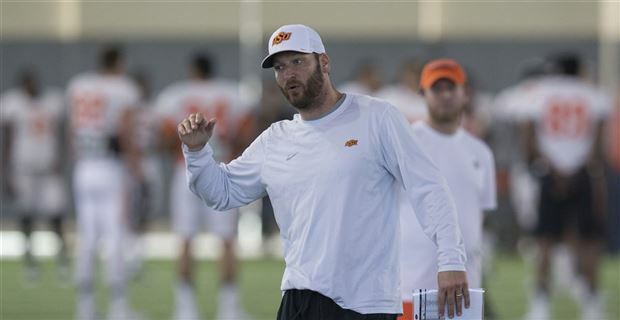 It’s also a window into what makes Oklahoma State’s offensive coordinator one of the sport’s fastest-rising stars. “It’s like you’re in a time warp,” Yurcich told 247Sports. That thirst for football understanding is the central theme of Yurcich’s career, one that’s taken him from his first coordinator job at Saint Francis (Ind.) to Oklahoma State, where he’s led a Top 25 offense in three of his four seasons. He’s been so good, his star pupil Mason Rudolph fretted this offseason after Yurcich’s name popped up in serious association with head coaching and coordinator jobs at places like Tulane and Alabama. Yurcich might sit daily in front of a large glass window overlooking Boone Pickens Stadium in a facility that rivals any in the country. But, at one point in his career, he wondered if he’d ever make it to the FBS ranks. His play-calling dreams and drawings started as a quarterback at California University in Pennsylvania. When Yurcich found himself reciting plays in class, he knew his future was in coaching. Those thoughts led to a most unusual path. At Saint Francis he did everything from lining the field to mowing the grass. In 2003, after four years cutting his teeth, he took a graduate assistant role at Indiana. In 2005, he went to Edinboro University (Penn.) for what turned out to be a six-year stint. That reads like a resume, yes, but it’s also critical to understanding Yurcich’s path. After the six years at Edinboro, Yurcich had all but accepted that he’d be a Division II coach unless he did something spectacular. He needed to take risks. He needed his offenses to score points in bunches. He needed to win. “After you coach six years in Division II you stop calling guys to get your foot in the door as a Division I coach,” Yurcich said. “That’s just the way it goes. In 2011 Yurcich took what he calls a “lateral move” to become the offensive coordinator at Shippensburg University (Penn). He inherited what had been a roster built for the Wing-T and installed an up-tempo spread attack. Yurcich had a head coach, newly promoted Mark Maciejewski, who gave him room to experiment. There, his notebook scribbles came to life. The end result of those schemes was two record-setting seasons with Shippensburg. His first team set school records for points and total yards. His second, in 2012, Shippensburgh led the nation (D-II) in total offense and finished second with 46.9 points per game. After that spectacular campaign with Shippensburg, Yurcich felt ready to take a step. He interviewed for the head job at West Virginia State. Yurcich thought being Division II head coach is how he’d support his family, an opportunity to “try and buy a house” and make $80,000 a year. “I was crushed,” Yurcich said. A few weeks later, Oklahoma State head coach Mike Gundy made a surprise call to Yurcich. Then Gundy flew out to meet Yurcich. Shortly after that, he was Oklahoma State’s new offensive coordinator. Gundy wanted a bright, innovative offensive mind that would fit into the Cowboys preexisting system, an attack that’s found success through a litany of coordinators over the years. The sandbox isn’t quite as open as it was at Shippensburg, but Yurcich has found the balance. His offenses at Oklahoma State have varied widely at times, yet they’ve all found success. In 2015, for example, the Cowboys did not feature a running back who earned more than 518 yards or four touchdowns, so he employed quarterback J.W. Walsh as a situational goal-line rusher. As a change-of-pace option for Rudolph, Walsh scored 13 rushing touchdowns and Oklahoma State finished 13th nationally in points scored. The next year, buoyed by the play of freshman running back Justice Hill (1,142 yards, 6 TDs), the Cowboys offense again finished in the Top 20. With Rudolph (4,091 yards passing), Hill and wide receiver James Washington (1,380 yards), Oklahoma State was one of just two Power Five programs to have a 4,000-yard passer, 1,000-yard rusher and 1,000-yard wide receiver. Rudolph relays that memory in his finely-tuned Yurcich impression, and it’s appropriately loud. Just as Yurcich gets absorbed in drawing plays, his passion for getting them right is reflected in the meeting room. But that’s the type of spirit that stems from a coaching journey like Yurcich’s. “You can tell by his attitude and stuff that he wasn’t always the guy that was here at the D1 stage,” said Oklahoma State senior offensive lineman Larry Williams. “You can tell he worked his way up and it means a lot to him and he’s not trying to let people down. Entering 2017 the Cowboys return seven offensive starters, including their potent skill trio, on a team that will likely enter the season ranked in the Top 10. Rudolph is a Heisman dark horse, Washington should compete for national awards and Yurcich will likely be a Broyles Award nominee (given to the nation’s top assistant coach) for a second straight year. Yurcich will be around for what could be a special season in Oklahoma State history. Still, the grass won’t always remain greenest in Stillwater. Gundy’s assistants, including recent coordinators Larry Fedora (UNC by way of Southern Miss), Dana Holgorsen (West Virginia) and Todd Monken (Southern Miss), have gone on to head coaching jobs after their OC stints at Oklahoma State. Yurcich's aspirations are no less lofty entering his fifth season at Oklahoma State. He wants to be a head coach one day and will be. But the situation he’s in, under the guy he calls the “rattlesnake hunter,” is hard to let go of. “I think about it a lot,” Yurcich said. “When you’re working for a guy like Coach Gundy you’re getting a crash course on how to be a head coach. He communicates well and every person in this program, we all know what the values are and what the culture should be. That’s the most important thing, the communication aspect and the relationships. That’s what makes him great.